MONTEREY COUNTY — Caltrans has received confirmation from National Weather Service (NOAA) data that a significant storm will reach the areas of Mud Creek (PM 8.9) and Paul’s Slide (PM 21.6) on State Route 1 in the Big Sur area this evening. The Highway 1 closure, for traveler safety, will include the areas of Mud Creek and Paul’s Slide, closing today, Tuesday, March 5 at 5 pm until further notice. SEE ATTACHED CLOSURE MAP. The closure initiation process will begin at 3 PM with Electronic Message Signs activated and both sets of gates (Mud Creek and Paul’s Slide) closed by 5 pm today. Storm activity is currently forecast through Thursday, March 7. Businesses along the Big Sur Coast on Hwy. 1 remain open and are accessible via Hwys 101, 68, 46. Caltrans’ Geotech, Maintenance and Construction units are on call and prepared to inspect/clean up when the storm ends during the daylight hours and it is safe to be onsite again—we currently anticipate this to be Thursday, March 7 (weather dependent). Caltrans’ goal is to open the roadway as quickly and safely as possible and our staff remains on-call 24/7. NOTE: Both Mud Creek and Paul’s Slide will close today. An update will be provided by the afternoon of Thursday, March 7 or sooner. This advisory is to inform the public to be prepared for preemptive closure of the roadway scheduled for 5 pm Tuesday, March 5th due to a significant storm. A final notice will be sent just prior to the roadway closing. Caltrans will have our Geotech, Maintenance and Construction units on call and prepared to inspect/clean up during daylight hours when the storm ends and it is safe to be onsite again. NOTE: These advisories apply only to the Mud Creek and Paul’s Slide areas with each closure being treated separately–both locations will close at 5 pm Tuesday, March 5th. Please stand by for additional information. 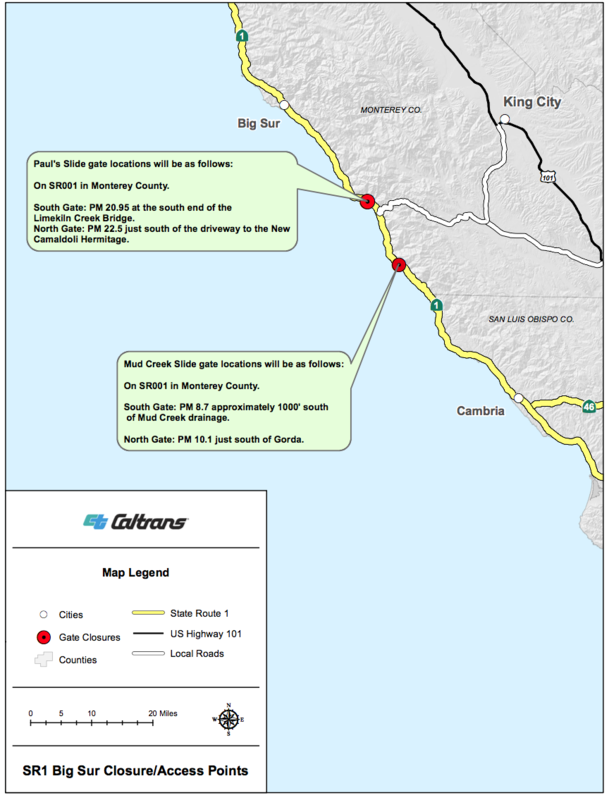 Re: Film Production Activity on Highway 1 in the Big Sur Area Scheduled for Monday, March 4th and Tuesday, March 5th, and Wednesday, March 6th, 2019. 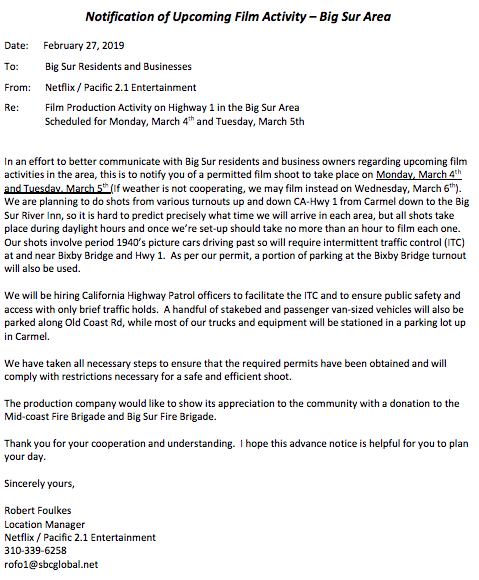 In an effort to better communicate with Big Sur residents and business owners regarding upcoming film activities in the area, this is to notify you of a permitted film shoot to take place between Monday, March 4 through Wednesday, March 6th. If weather is not cooperating, we may film on an additional day to be determined. We are planning to do shots from various turnouts up and down CA-Hwy 1 from Carmel down to the Big Sur River Inn, so it is hard to predict precisely what time we will arrive in each area, but all shots take place during daylight hours and once we’re set-up should take no more than an hour to film each one. 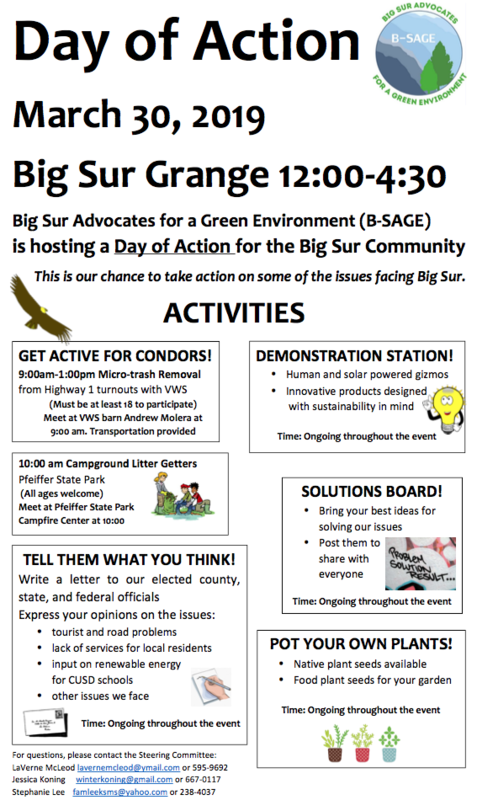 Also on Wednesday we will be working around the area of the Grange. We are planning on two (2) night shots that should be completed by 10-11 PM. Our shots involve period 1940’s picture cars driving past so will require intermittent traffic control (ITC) on Hwy 1. We will be hiring California Highway Patrol officers to facilitate the ITC and to ensure public safety and access with only brief traffic holds. A handful of stakebed and passenger van-sized vehicles will also be parked along Old Coast Rd, while most of our trucks and equipment will be stationed in a parking lot up in Carmel. We have taken all necessary steps to ensure that the required permits have been obtained and will comply with restrictions necessary for a safe and efficient shoot. The production company would like to show its appreciation to the community with a donation to the Mid-coast Fire Brigade and Big Sur Fire Brigade. Thank you for your cooperation and understanding. I hope this advance notice is helpful for you to plan your day. 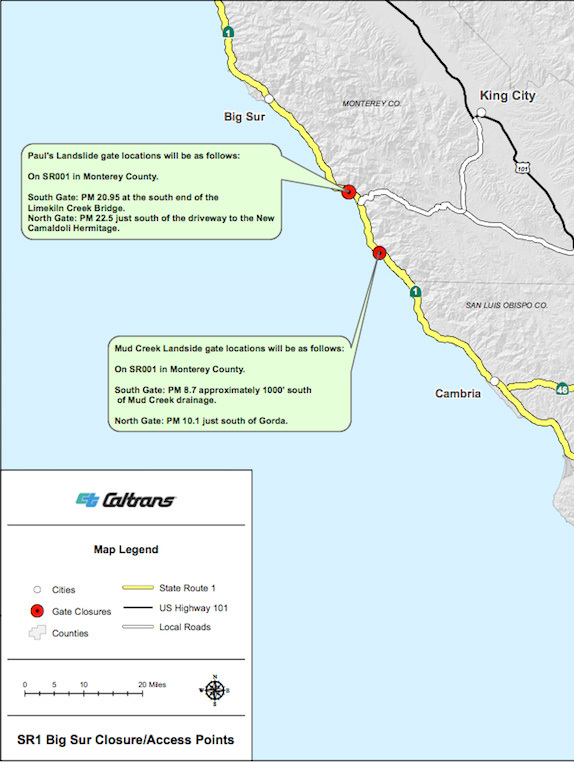 BIG SUR – A construction project to widen shoulders on the existing roadway and upgrade the guardrail is scheduled to begin tomorrow, Friday, March 1st along State Route 1 between Hurricane Point and Rocky Point in Big Sur, Caltrans officials announced today. MONTEREY COUNTY — Caltrans has received confirmation from National Weather Service (NOAA) data that the significant storms have passed in the areas of Mud Creek (PM 8.9) and Paul’s Slide (PM 21.6) on State Route 1 in the Big Sur area. Caltrans Geotech, Maintenance Design and Maintenance crews assessed all areas within the closure limits earlier today. Highway 1, including Mud Creek and Paul’s Slide will fully reopen by 10 am today, Wednesday, Feb. 27. Caltrans’ Geotech, Maintenance and Construction units are on call and prepared to inspect/clean up when each storm ends during the daylight hours and it is safe to be onsite again. Caltrans’ goal is to open the roadway as quickly and safely as possible and our staff remains on-call 24/7. MONTEREY COUNTY — Caltrans has received confirmation from National Weather Service (NOAA) data that a significant storm will reach the areas of Mud Creek (PM 8.9) and Paul’s Slide (PM 21.6) on State Route 1 in the Big Sur area this evening. The Highway 1 closure, for traveler safety, will include the areas of Mud Creek and Paul’s Slide, closing today, Tuesday, Feb. 26 at 5 pm until further notice. SEE ATTACHED CLOSURE MAP. The closure initiation process will begin at 3 PM with Electronic Message Signs activated and both sets of gates (Mud Creek and Paul’s Slide) closed by 5 pm today. Storm activity is currently forecast through the morning of Thursday, Feb. 28. Caltrans’ Geotech, Maintenance and Construction units are on call and prepared to inspect/clean up when the storm ends during the daylight hours and it is safe to be onsite again—we currently anticipate this to be Thursday, Feb. 28. Caltrans’ goal is to open the roadway as quickly and safely as possible and our staff remains on-call 24/7. NOTE: Both Mud Creek and Paul’s Slide will close today. An update will be provided by mid-day Thursday, Feb. 28 or sooner.